Isometric, Dungeons & Dragons-style RPGs are a natural fit for any gamer wielding a keyboard and mouse. The breadth of decisions to be made and the depth of skill trees in these sorts of offerings do not typically lend themselves well to consoles, whose controllers only have so many buttons with which to manage an entire party of would-be adventurers. In recent times, we’ve seen tried-and-true RPG franchises begin to simplify themselves in order to appeal to a broader audience, further cementing the kind of genre that Divinity: Original Sin 2 – Definitive Edition finds itself in as a PC powerhouse. It’s with some amount of surprise, then, that I found Divinity: Original Sin 2 – Definitive Edition to be one of the smoothest RPGs I’ve played on console in a while. I was fully aware that it was still a Larian Studios project, so the quality of the game never struck me as anything less than the stellar bar that group has set for themselves. Still, as a PC game coming to a console with streamlined controllers, I had concerns. All my reservations about porting an input-heavy, micro-management filled RPG to the PS4 have gone unfounded. Divinity: Original Sin 2 – Definitive Edition should be used as a how-to guide for these kinds of platform transitions in the future, and is every bit the brilliant, engaging masterpiece that it was when it debuted on computers nearly a year ago. If you’re completely in the dark about Divinity: Original Sin 2, the game follows the player character as they journey to discover what it means to be Godwoken, a hero chosen by one of the seven gods to become an even more powerful god themselves. The story is western RPG storytelling at its finest, and the characters are memorable, three-dimensional, and suitably snarky whenever there’s an opportunity for a quick quip about the hygienic habits of a towering monstrosity. The game is absolutely littered with Things To Do, and those things often subtly tie into one another in ways that even made my haphazard paths across levels somehow make sense. While my approach to exploring the world could best be described as throwing darts at a map, choosing where they land, and then still somehow getting lost, the game’s gigantic array of quests and content made every effort to see me guided to the next story beat. It’s great, but then again, it’s also what made the original version of the game such a hit – nothing really new to report there. What is new is how gorgeous this port looks, at least on a PS4 Pro with a 4K television. While my console did start to kick into some of its heavier renditions of cooling fan serenades occasionally, that never reflected in the game’s performance, which was constantly smooth. Even complex battlefields progressed without a hiccup, something that isn’t always a given when leaving such a high-powered platform as PC gaming for a console, even one as impressive as the PS4 Pro. Luckily, there aren’t any issues with presentation or performance, which made progressing through the campaign all the more pleasant. 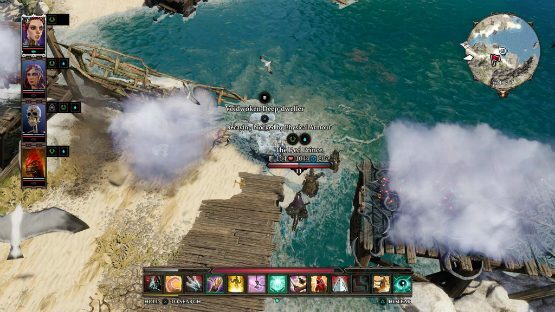 One of the best reasons to own Divinity: Original Sin 2 on the PS4 is because the multiplayer co-op gameplay in the campaign is so well-suited for it. Sitting down beside a friend, creating two characters, and taking on the world is exciting, and the game’s split-screen handles everything admirably when characters get too far apart from each other. Navigating intense tactical battles is incredibly fun as well, and it’s charming on console in a way that’s reminiscent of the couch co-op heydays of yore. Of course, the way the game plays out, it’s often better to have two heads working on the same problem rather than going it alone. Divinity: Original Sin 2 is a game full of challenging puzzles and complex warfare, and strategizing on the fly with a partner can lead to some of the most memorable moments in a playthrough. Once again, the feel of nudging your friend to teleport an oil barrel into the center of a conveniently located enemy swarm and letting fly some fire arrows feels right at home on the PS4. 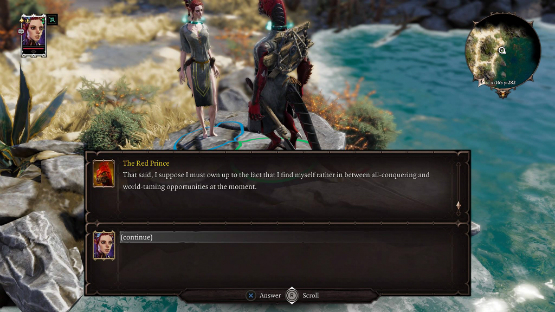 Naturally, players can still use the online co-op mode to recruit a party of up to 4 people as well, so you don’t have to have someone beside you to experience the fun of a multi-person campaign in Divinity. It’s just another option in a game that is full to the brim with them. The one major complaint I have, and the thing that keeps this game from achieving perfect port status, is that Larian Studios still hasn’t found a way to bring Divinity: Original Sin 2 – Definitive Edition‘s inventory management to consoles in a compelling way. Inventory management is a total chore, and it becomes increasingly important as the game progresses. Assigning skills to skill bars helps mitigate combat from being the same way, but it just felt like way too much work to keep everything in my inventory flowing smoothly between who should be holding what. By that same token, input can sometimes feel a little clunky because you need to jump through a couple of extra hoops to use things like the hot bar that you wouldn’t normally need to do with a keyboard and mouse. It’s nothing that drags the experience down too much, but it does feel a little out of place in a game that is so intelligently designed on all fronts. That might just be the limitations of bringing a game like this onto a console, though. There’s probably no clean answer that fixes these minor issues, but they’re annoying enough that it does detract very slightly from the rest of the seamless integration onto the PS4. At the end of it all, Divinity: Original Sin 2 – Definitive Edition is still the RPG dream it has been since its release. Better still, there are a few compelling reasons to own this title on PS4 this go around, and players don’t need to sacrifice how it looks or performs in order to do so. If you haven’t played Divinity: Original Sin 2 – Definitive Edition and you’re into RPGs, tabletop gaming, or sprawling narratives full of choice, now is the time to jump in. Games like this deserve to be enjoyed thoroughly, and the PS4 version of Larian Studios’ sequel allows fans to do just that. Just keep in mind that, for all of the luster added to the console version of the game, the PC version is still likely the more informed choice for those who want the best experience possible. Divinity: Original Sin 2 – Definitive Edition review code provided by publisher. Version 1.01 reviewed on a PlayStation 4 Pro. For more information on scoring please see our review policy.